(Contest has ended) GSCinemas 31st Birthday Giveaway! 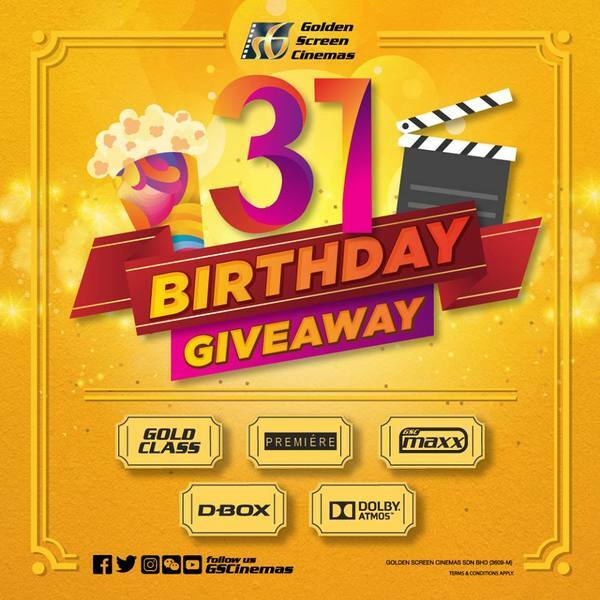 GSCinema is giving away 155 pairs of movie tickets, all you need to do is to wish GSCinema a happy birthday and share the post! I sincerely hope that it is not an April Fool prank! 31 pairs of Gold Class tickets! 31 pairs of Premiere Class tickets! 31 pairs of GSC MAXX tickets! 31 pairs of D-BOX tickets! 31 pairs of Dolby Atmos tickets! Step 1: Give a reaction to this post! Step 2: Comment below and wish us Happy Birthday! Step 3: Share this post with hashtag #GSC31 and ask your friends to join the contest too!